Market-Share: Breadtalk and the "Peace Panda" buns. 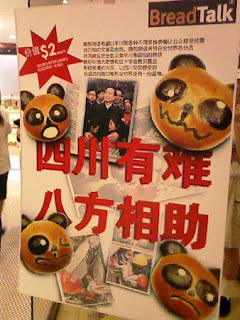 Breadtalk and the "Peace Panda" buns. The earthquake in Sichuan has been a heart-wrecking disaster, not to mention Myanmar also suffered a similar fate just 2 weeks before China when a cyclone hit the forgotten land. Both individuals and corporations have stood forward leading the humanitarian efforts in collection of aids in both kind and monetary. One of the most proactive players, Breadtalk who owns business in China has initiated the efforts by contributing 100% of the proceeds from sale of a specially created bun called the "Peace Panda" as a support to help the disaster. This effort is in collaboration with the Red Cross, and has since put together SGD40,000 in barely a week. What has this done to both the society and their business? Breadtalk has performed a good example of Corporate Social Responsibility (CSR) and as a CRM strategy, it has indeed worked very well for its brand. What kind of rollover effect does it have? Firstly, media coverage. The earthquake is top of the mind concern for every single person on the street and everyone is interested in reading the latest about it. The fact that Breadtalk has led such an effort has built a top of the mind brand recall for their business, further stregthening their market position as the big brother in the bread lines. Secondly, the interest it has created caused a word-of-mouth marketing effect. The "topic" that people wants to talk about. "Hey have you bought the Panda bread yet?". And another person will be off to buy it as a gesture of support. So it thus created both the "attention and intention" to purchase. Thirdly, no matter in approval or disapproval, people started talking about it on blogs and forums (do a search on google and you will see plenty), tapping the power of Social Media Marketing. The internet has a long memory and reaches beyond just the localised demographics. This further created a stronger branding for Breadtalk in the region. As Breadtalk has alot of businesses in China, regardless of how insignificant their efforts may seem like, they have already created a top of the mind brand recall for the 1 billion chinese population, especially in patrotic China. So the next time a local Chinese wants to buy bread, they will remember how Breadtalk have supported the disaster. And that will translate into a long term ROI. Blogs is not a social media strategy!